Vitamin D deficiency - Dr R Padmakumar et al. Vitamin D deficiency : Dr R Padmakumar et al. Excessive intakes of vitamin D can lead to high levels of calcium (hypercalcemia). The symptoms of this are weakness, confusion, constipation, loss of appetite and development of painful calcium deposits. To avoid this, advice to keep the supplement intake below the tolerable upper limits. 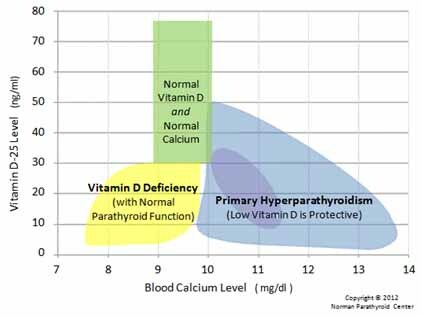 In vitamin D deficiency due to reduced oral intake or reduced sun exposure ,Vitamin D level and calcium level will be low with normal parathyroid function. Calcium level will be high and vitamin D will be low when primary hyperparathyroidism exists. Research has begun to show a relationship between BMI and vitamin D deficiency. A study done on 2,187 overweight and obese subjects, found that those with a BMI above 40 had 18% lower serum vitamin D levels than those with a BMI under 40. Some possible reasons for this are lower intakes of vitamin D , less exposure to sunlight (uv) radiation and a higher distribution volume of vitamin D . Even with exposure to sunlight, there remains a risk for deficiency. Morbid obese patients have a higher incidence of high PTH and low vitamin D even before surgery compared with normal individuals. In gastric bypass: low calcium absorption due to bypassed duodenum and jejunum may be the cause. In sleeve gastrectomy the vitamin D and calcium level are maintained within normal limits compared to bypass surgery. Gall bladder removal may reduce vitamin D and magnesium levels. This may be due to reduced absorption of fat soluble vitamins (D, E, A and K). People with compromised liver or digestive function are often vitamin D deficient. Exposure of skin to the sun’s UVB rays enables body to manufacture vitamin D. However, this process occurs in the liver and kidneys. Here people with a sluggish liver often do not manufacture vitamin D adequately. When the blood level of vitamin D is below 30 ng/ml, a minimum of 1,000 IU/day will be needed for children and 1,500 to 2,000 IU/day of vitamin D3 for adults. Another rule of thumb is for every 1 ng/ml increase in blood level one need is an additional 100IU/day. In obese patients , with malabsorbtion syndromes and patients on medications affecting vitamin D metabolism, it is advised to have a higher dose (two to three times higher , atleast 6,000-10,000IU/day) of vitamin D to treat deficiency to maintain a 25(OH)D level above 30ng/ml, followed by maintenance therapy of 3,000-6,000IU/day. After parathyroid removal , may be wise to have a concomitant replacement of vitamin D with calcitriol (0.25-1mcg/day). Dependence on calcium supplementation for more than 6 months shows permanent hypoparathyroidism; which will necessitate continued use of such medications.